Last month, I started doing a weekly live chat with interesting people I know, and it’s been so much fun! 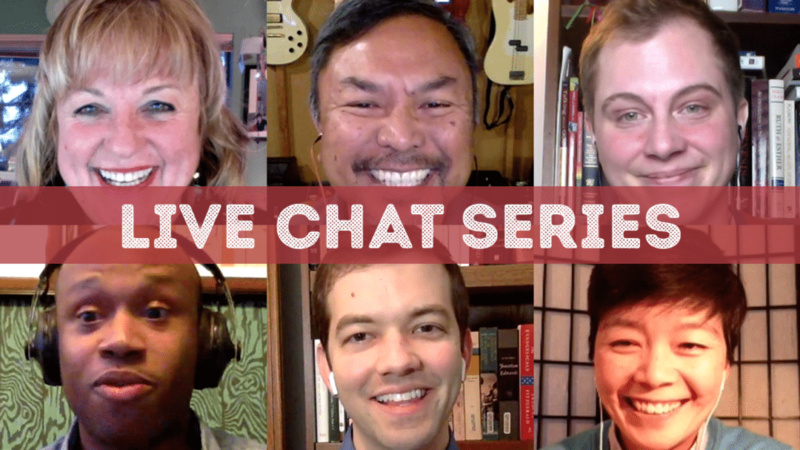 These first six interviewees have all been related in some way to LGBT+ issues and Christian faith, but the discussion is really for everyone. We chat on Facebook Live every Monday night for an hour, discussing silly and serious topics and taking questions from live viewers—and then each episode goes up on my YouTube channel for higher-quality viewing. In case you missed them, here are the first six interviews. Kathy Baldock is a straight Christian advocate for LGBT+ inclusion and author of Walking the Bridgeless Canyon. In this episode, we talk about her research for an upcoming book and the weird ways the Bible has been misused. Austen Hartke is the creator of the popular “Transgender and Christian” YouTube series and author of Transforming: The Bible and the Lives of Transgender Christians. In this episode, we discuss faith, gender identity, and misconceptions people have about transgender people. Danny Cortez made national news when, as a Southern Baptist pastor, he changed his mind on homosexuality—and then discovered that his own son was gay! In this episode, we talk about his story and what it’s like to be the parent of a gay child, and we also have some fascinating conversation about race and its influence on the whole discussion. Matthew Vines is one of the most prominent gay Christian voices of our time, author of God and the Gay Christian and founder of The Reformation Project, an organization working to change church views on LGBT+ people. In this episode, we talk about his journey, relationships, politics, and how he responds to his critics. Matthew Adam is an independent filmmaker whose short film Human emotionally raises issues of race in America and calls for recognizing the humanity of all people. In this episode, we talk about how he got into filmmaking and how our differing experiences of race are important for understanding the issues our world faces today. Oneida Chi is a speech pathologist working with transgender clients to help them learn to make their voices reflect how they want to present themselves to the world. In this episode, we talk about how our voices are gendered, what it means to “sound gay,” and Oneida’s own journey as a Christian who is both Asian American and an LGBT+ person. For more interviews like these, don’t forget to subscribe to my YouTube channel and visit my Facebook page at 8pm Eastern on Monday nights if you want to participate live. And if you have an idea for a guest or topic you’d like to see me cover, let me know!